Got Money, Got Honey! : Hey hey hey hey, what's more important - Market Cap or Unit Price? Hey hey hey hey, what's more important - Market Cap or Unit Price? I really have to post this. The amount of stupid rolling into cryptos is just frightening. You aren't scared to lose money? I don't know why I'm so concerned about random internet strangers losing money. Maybe deep down inside behind my sarcastic facade, I'm actually a nice guy? Who knows. But come on now you retards, you can do better than this. This is the same thing even for stocks. When you evaluate something, what's more important, market cap or unit price? Yes, it's a very complicated formula. I hope you passed Primary 2, or else you might not do well in crypto. Here in crypto, we set the bar really high, I know. If you read my previous post, you'd notice a VERY important chart. Yes, I also post important graphics, not just gifs to mock people. For the people reading just this article, I have attached the chart for your lazy viewing pleasure. What does this mean? 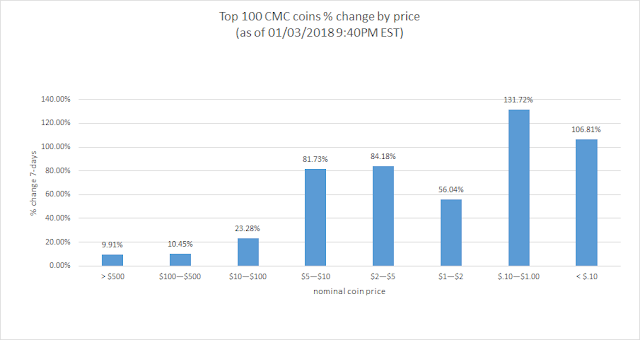 This means that everyone is buying into the "CHEAP" crypto - cheap being that the unit price / face value of the crypto is less than $1. Which is sad because a lot of people are going to lose money when other people realize that their crypto isn't exactly that "cheap" anymore. Here is an interesting tweet from Boxmining about what the price of certain crypto would look like if we adjusted their supply to Bitcoin's supply. Are you ready? 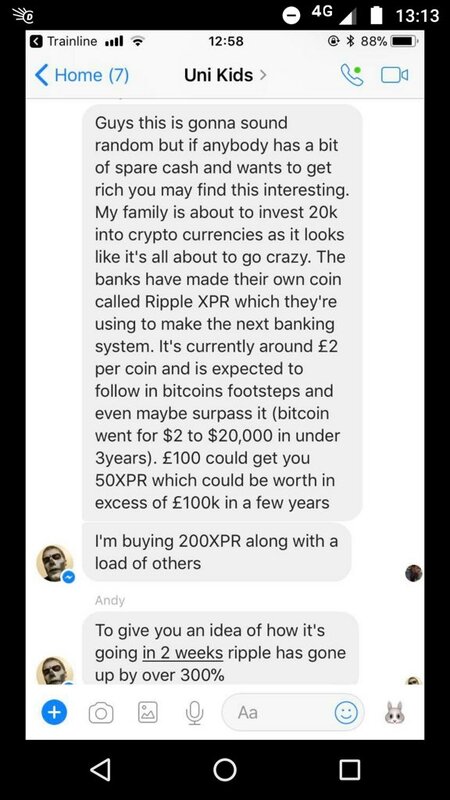 Yes, if Ripple has the same total supply as Bitcoin, 1 XRP would be more expensive than Bitcoin and would be valued at $18,953 (as of 4th Jan), not $3. The reason why 1 XRP is $3 is because there is 38,21312312,312,312,312,312,24124,32 in existence (slight exaggeration). Price is absolutely irrelevant if you know nothing about the circulating / total supply. Of course, circulating and total supply in crypto is a known number. This is crypto after all. But I am sure that along with market cap, it is an extremely overlooked piece of information by new "investors". So now, look at your portfolio. How many of them do you really understand what it does and why it is valued so? Did you pick crypto based on what it does, or what was its price? Don't go google what your crypto does and now tell me you're in it for the tech after the fact that you bought it because it's cheap. I know plenty of you guys sort based on unit price and buy based on that. Do you have a lot of crypto in your portfolio that you bought because "they are cheap"? I have a special shirt for you. Don't get me wrong. I am not saying to avoid crypto less than $1. I'm just saying that if you're buying crypto less than $1 purely because it's less than $1, then you are retarded. Oh my, so explicit and confrontational? Well, you are. Just saying. Less than 10% of my holdings are in crypto with a face value of less than $1. And they are truly in crypto that I feel are "cheap", with market caps below $50m. Yes, I do take risks in some shitcoins, but guess what? My ROI on them are over 200% since my entry and I'm still very comfortable holding onto them because of fundamental reasons. I wish many of you the best of luck, but you know what? I already KNOW that a lot of you are going to get rekt and then call crypto a scam and fraud after you lose a lot of money. It's sad, but that is what will happen. See you guys at the crypto front lines. I hope for your sake that you're fighting on the right side, or else be prepared to get steam rolled by me. Im feeling more retarded then the herd for not seeing that this was how it would unfold, or i had a feeling this was how the markets would be driven when the herd would come but never believed it enough to act on it (might have been me being lazy too). I mean, of course there would be facebook groups and chats where people would ask for advice on coins under a dollar, i did the same last year but i looked at total nr of coins as well. But last year there were a lot more coins under a dollar and a coin count under 100m. And those low prices (but also low market capped) coins were the one which gave me the most roi. I mean, Neo, NAV, Ardor, Lisk, Waves, were all under a dollar. Since you seem quiet invested in DGD, i would love to see a full updated review of them by you for this year. I recently converted some alt to DGD but i am resistant bc of their lack of community engagement in the big forums such as bitcointalk and reddit. I mean, how are hey going to marked DGX if they cannot even market DGD or keep the holders engaged. I am also worried with the new comming Singapore regulations, what are their thoughts of a DAO, will we eventually lose the A in the DAO? Don't beat yourself over it. It was the obvious, but uncomfortable trade. If I had knew how much money there was to be made, I would have allocated a small portion of my portfolio to take advantage of the situation. Hindsight is always 20/20. The entire market as a whole is getting bigger valuations as the market is maturing. Some of them are deserved, others are quite lacking to me. I actually want a purge to come, there is just too much overvalued crap and that is bad for the crypto space as a whole. A mini-review on DGD is coming, but it would probably not as comprehensive as you would like, though it covers the main points. Their community was most active on Slack and they have now moved over to Discord. The reddit page is just to post the weekly update, but all the discussions between the team and larger holders happen in Discord. Since they run the Eth meetup in Singapore, I think they are quite well known, at least from the organizers side and the adoption of DGX is likely to be a push, rather than pull (imo). I must point out that the actual number of DGD holders are extremely small. Just a handful control the entire voting power of the DAO, so the opinions of everyone except of the top 250 holders is just noise. The community doesn't have a large interest in promoting the DGD token, they are all focused on the proliferation of the DGX token instead. With them being in the MAS Sandbox, I would think that regulations would be quite favourable to them. I'm mostly worried if they will need to change the structure of the DGX governance rewards for compliance reasons. It seems very unlikely for now, but we will have to wait and see. The big milestone coming up is the finish of the audits within a few weeks and then the actual launch of DGX 2.0. Yes, guess one have to be happy with the gains one have had, even though cryptos almost always feels like lose lose (for your mind, not wallet). You blame yourself for lost opportunities everywhere. You do 50x and your angry you didnt invest more, an investment doesnt move (or "only" do 2x) while others skyrocket and you feel bad you didnt put a small sum in the others. I could imagine such would be the case, which is also a bit worrying. Since they will have the have majority vote, couldn't they just vote for making it more favorable only for the top dgd holders (regarding rewards for example) leaving the small investors dgd tokens "worthless". Hopefully one will be able to redeem ETH from in the trust, but from what ive read that isnt 100% yet. If that would be the case, dgd is undervalued with a current price of ETH at 1100usd and not thinking that ETH is overvalued by itself. Being in a MAS Sandbox should be beneficial, i hope they let them implement their vision fully. there's only so much we can say but if people don't wanna listen...well that's their money and their problem. can't say we didn't try! Holy. This situation is real man. Coincidentally I wanted to write about this issue as well. Many had failed terribly to understand the difference between unit price and market cap. The common misconception of cheap being low unit price is seriously frightening. Guess this game here today, has evolved and became more exciting with the ignorant fresh funds coming in LOL!! I'm thinking of making an equal weighted portfolio of those 2 coins to see how the newbies are doing, haha. I've given up trying to explain unit price to people. Once they get rekt, maybe they will understand. My bet on TRX failed so far, the only top 10 coin less than 50 cents. Luckily just a small bet, let's see how it turns out. So many coins, so many darts to throw. Shiok. I'm telling myself if I'm gonna buy one more Altcoin, I have to sell one SGX stock. Yesterday sold Comfortdelgro and bought AION, ETC. Everyone is shilling ETC on Twitter now lol. TRX and ETC, ugh, such cancer. I avoid those coins. They might be good for speculation and trading, but neither have good fundamentals in my opinion. Losing Money by Making Less Money? You were all right, it's crashing. I'm out. The HERD is coming into Crypto!! !